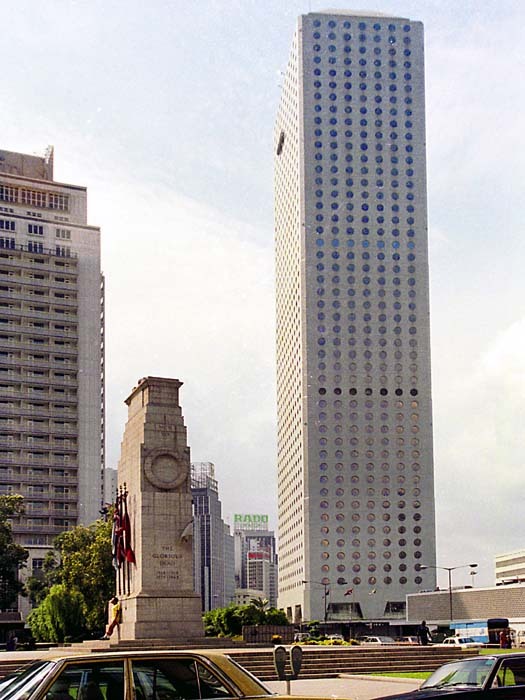 Connaught Building (the tall one) and the Second World World Memorial for British Soldiers. In the early 70's these were the HK offices of the London design team (DRU) working on the 1st phase of the HK Mass Transit. It was affectionately known then as 'the building of a thousand r-souls. I first went to HK in 1978 and was treated to an elevator ride in this building, my first on a skyscraper. I remember having to ride two elevators from the Ground Floor to its penthouse. My last trip to HK was 30 years later in 2008 before I migrated to the US. I was sorry for not having seen this building. I would have ridden its elevators again just for posterity. Oh I'm glad it's still around too! It was the tallest building when I left HK in the late 70s for New Zealand - I was 10. I'm going back soon, I'll have to go and see it! Now known as Jardine House. Still one of the best-looking skyscrapers in Hong Kong, but it's hemmed in by the hideous Exchange Square now. This was the tallest building in HK at the time(late 60's/early 70's). I left for Vancouver, BC shortly after it was built. I was 8yrs old. Thanks for the memories. This is the building where I worked at for almost ten years, on the 28th floor and the top floor where the Jardine's executive office was located at. Now I am living in Toronto. Thanks for bringing back fond memories.